If your question is not answered below, please contact the studio for customer service. It usually takes 1-2 weeks (sometimes 3) from the time we receive your order until the time it will be shipped. You will receive an e-mail with tracking information as soon as your order ships. Yes. Rush orders can usually be accommodated with an additional shipping charge. 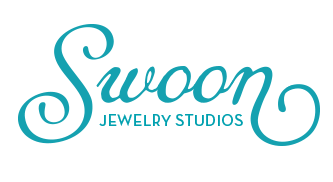 Please call the studio or email hello (at) swoonjewelrystudios.com if you are on a tight deadline. we can quote you on a shipping charge and get it out to you right away. Rush charges usually run around $25.00. No, unfortunately we cannot. Our jewelry is made by hand without the use of time saving machinery, therefore our pieces are usually a multi-day process to create. You may consider one of our gift certificates, which can be ordered in any value. The gift certificate can be shipped overnight and is a nice option if you are in a hurry. If you can dream it, we can most likely make it. If you have an idea for something you do not see on the website please email or call with your design request. we love commissions am happy to provide price quotes on special designs in a prompt fashion. What if my name(s) don't fit on the charm that we want? You could consider using a nickname or initials. We are also happy to custom-cut discs to the size of your child’s name. Please contact me for custom orders and a price quote. I am planning to have more children. Can we order another charm in the future? Yes. We can add onto existing necklaces and bracelets. See the “Add a Disc” option in the A La Carte section. Yes, each piece of Swoon jewelry arrives in a signature box, ready for gift–giving. If you are shipping jewelry to a loved one, let us know and we will include a gift card with the message of your choice at no additional charge. Do you darken the stamped letters? Yes. It is an extra step we take to add a black patina, which we believe makes for a beautiful product that is heirloom quality. Can we include a birth date or other stamping on the back of the charms? The only stamping on the back of the charms that we offer is a birth date and this requires extra polishing on the front of the charm to ensure that it looks pretty. Stamping letters on the back of the charm shows through to the front side. This tends to make the front of your design look untidy and not well crafted. So from a design perspective it is best to stick with only the birthdates on the back. What type of clasps do you offer? Most of our designs come with a sturdy lobster clasp and each piece includes a signature disc stamped with “swoon,” which is attached to the chain.